Free Printable Australia Word Search Puzzle. Print this Australia word search free and have fun trying to find Australia’s places to visit on your next vacations, food, sports, animals, plants. You are going to have so much fun with your kids learning more about Australia. Share at school, with your kids or when traveling to Australia. 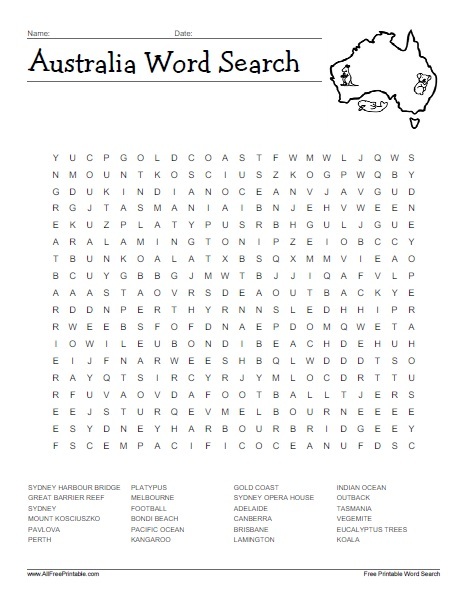 Find all the words in this Free Printable Australia Word Search Puzzle like Kangaroo, Gold Coast, Sydney, Koala, Outback, Bondi Beach, Great Barrier Reef, Tasmania, Pacific Ocean, Vegemite, Mount Kosciuszko, Sydney Opera House, Eucalyptus trees, Canberra, Melbourne and more. This easy word search includes 24 words and the solution on page 2. The Australia Word Search Game is ready to print in PDF format.